I had a fellow on my latest podcast, released Sunday, who insists the world population will crash 90-plus percent from the current 7.6 billion to 600 million by the end of this century. Jack Alpert heads an outfit called the Stanford Knowledge Integration Lab (SKIL) which he started at Stanford University in 1978 and now runs as a private research foundation. Alpert is primarily an engineer. At 600 million, the living standard in the USA would be on a level with the post-Roman peasantry of Fifth-century Europe, but without the charm, since many of the planet’s linked systems -- soils, oceans, climate, mineral resources -- will be in much greater disarray than was the case 1,500 years ago. Anyway, that state-of-life may be a way-station so something more dire. Alpert’s optimal case would be a world human population of 50 million, deployed in three “city-states,” in the Pacific Northwest, the Uruguay / Paraguay border region, and China, that could support something close to today’s living standards for a tiny population, along with science and advanced technology, run on hydropower. The rest of world, he says, would just go back to nature, or what’s left of it. Alpert’s project aims to engineer a path to that optimal outcome. The Romans had their own version of a financialized economy: they simply devalued their coins by mixing in less and less silver at the mint, so they could pretend to pay for the same luxuries they had grown accustomed to as resources stretched thin. Our financialized economy -- like everything else we do -- operates at levels of complexity so baffling that even its supposed managers at the central banks are flying blind through fogs of debt, deception, and moral hazard. When that vessel of pretense slams into a mountaintop, the effects are likely to be quick and lethal to the economies on the ground below. In our time, the most recent crash of a major socioeconomic system was the fall of the Soviet Union in 1990-91. Of course, it happened against the backdrop of a global system that was still revving pretty well outside the USSR, and that softened the blow. Ultimately, the Russians still had plenty of oil to sell, which allowed them to re-set well above the Fifth Century peasant level of existence. At least for now. The Soviet Union collapsed because it was a thoroughly dishonest system that ran on pretense and coercion. Apparently, the U.S. Intel Community completely missed the signs that political collapse was underway. They seem to be pretty clueless about the fate of the USA these days, too. If you consider the preoccupations of two very recent Intel chiefs -- John Brennan of CIA and James Clapper, DNI -- who now inveigh full-time on CNN as avatars of the Deep State against the wicked Golden Golem of Greatness. Personally, I expect our collapse to be as sudden and unexpected as the USSR’s, but probably bloodier because there’s simply more stuff just lying around to fight over. Of course, I expect the collapse to express itself first in banking, finance, and markets -- being so deeply faith-based and so subject to simple failures of faith. But it will become political and social soon enough, maybe all-at once. And when it happens in the USA, it will spread through the financial systems the whole world round. 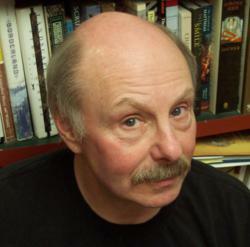 James Howard Kunstler is the author of many books including (non-fiction) The Geography of Nowhere, The City in Mind: Notes on the Urban Condition, Home from Nowhere, The Long Emergency, and Too Much Magic: Wishful Thinking, Technology and the Fate of the Nation. His novels include World Made By Hand, The Witch of Hebron, Maggie Darling -- A Modern Romance, The Halloween Ball, an Embarrassment of Riches, and many others. He has published three novellas with Water Street Press: Manhattan Gothic, A Christmas Orphan, and The Flight of Mehetabel.